JLM Couture designs, makes and distributes bridal gowns and bridesmaids dresses. The company offers nine different collections from various designers including Alvina Valenta, Hayley Paige, Jim Hjelm, Lazaro, and Tara Keely. JLM Couture’s products are distributed through around 800 retail locations domestically and internationally. Being A) a man and B) not especially sartorially gifted, I don’t know the first thing about the bridal industry. I don’t know what competitive trends are affecting JLM Couture, where on the price and quality spectrum JLM’s products fall or if their designers are actually well-regarded. A little googling shows retail prices for their dresses in the mid four figures, which I would guess is well above average. Truth is, I don’t care much about JLM’s competitive position or business strategy because the company is so, so cheap compared to the assets it owns. At a recent stock price of $1.90, JLM Couture has a market cap of $3.37 million. Book value is $9.85 million for a price-to-book value ratio of only 34.2%. One of Ben Graham’s most famous and successful investing strategies is the “Net Current Asset Value” or NCAV method. This method involves computing the value of a company’s current assets less all liabilities per share and comparing that figure to the company’s stock price. Graham recommended purchasing securities with stocks prices at least one-third lower than their net current asset value. JLM Couture easily satisfies this condition. At a share price of $1.90, JLM trades at a 60% discount to NCAV of $4.37 per share. Net current asset value is among the most conservative valuation methods, because it attempts to compute liquidation value, the value that would remain for shareholders if a company were wound down and all its liabilities were satisfied. Furthermore, NCAV ignores the value of non-current assets like real estate, machinery, brand names and other non-liquid assets. But for many analysts, the NCAV calculation is not conservative enough. After all, a liquidation scenario is rarely simple and the full book value of even the most liquid assets can rarely be achieved. Many analysts prefer to apply discounts to a company’s current assets. These discounts range from small for assets that can quickly be converted to cash (like cash itself and receivables) to large for current assets that are less easily sold (like inventory and pre-paid expenses). Even this more aggressive computation results in NCAV of $2.37 per share, 25% above JLM’s trading price. I assigned a 100% discount to JLM Couture’s pre-paid expenses because this current asset is entirely pre-paid advertising costs, and pre-paid advertising for a company that will no longer exist is as close to worthless as it gets. It’s pretty clear that JLM Couture trades at a substantial discount to liquidation value. But what good is that if the company has no plans to liquidate? 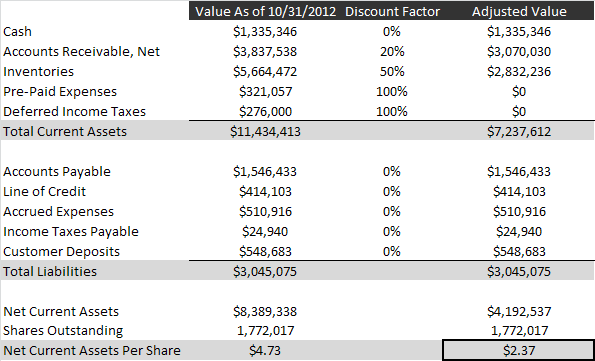 Turns out, liquidation is not the only way to realize value on a company that trades at a discount to NCAV. Mean reversion is a well-recognized phenomenon, and the tendency (on average!) of companies trading at extreme valuations to revert to more moderate values is well-established and has been observed in a number of academic studies. Investors in NCAV bargains can simply wait around for market opinion to change, trusting in current assets to take care of any downside risk. Many companies that trade at a discount to net current asset value are “melting ice cubes,” companies that are on track to eventually burn through their current assets through operating losses and poor investments. In these cases, investors must hope for mean reversion to kick in before NCAV disappears. JLM Couture, on the other hand, is profitable! The company earned 33 cents per share in 2012, giving its shares a trailing P/E ratio of 5.8. Sales were up 10.7% and operating income rose 341%. Unfortunately, JLM Couture’s history does not show consistent profitability. Earnings in 2012 were a mere shadow of what they were a decade ago, and margins have fallen considerably since then. The company was completely dark from 2005-2007. Still, profits are profits. A successful 2013 would increase JLM Couture’s NCAV value and widen the gap between NCAV and its share price. The market may eventually recognize the value of JLM Couture’s net current assets, or it may assign a higher multiple on the company’s earnings. It might not be soon, but companies tend not to trade at such extreme discounts for long. I own shares in JLM Couture. This has moved near the top of my to-do list. Thanks for the article. It’s quite a big discount to book value. Do you know why the company went dark? I have not reviewed old proxies for the exact reasons, but I would imagine they did so for the same reasons as most do: to avoid costs associated with SEC compliance. Nice write-up. I have owned shares for about 3 years. On the positive – they had a very nice year AND they opened up a 2nd store in LA. This store should become more profitable in the coming years. The negative. They issued stock options on 100,000 shares at $1.25….presumably to the CEO (Murphy) who probably owns about 1/2 the company (from old proxy statements). I don’t have a problem with the shares involved….just the price. Imo, the low price is heavily discounted and traded amongst “non-control” investors. We get no color on why the results differ from year to year. We receive no information on executive compensation. And the McGladrey & Pullen report does not even list the BODs. If they are going to issue stock options, the fairer way would be to have the business (whole) valued and base the price of that. My guess (with little assurance of accuracy is about 40% of revenue….$4 – $6 a share. Worth noting there are 300,000 plus shares in options that can still be issued…..so I think one should assume a minimum of 2,000,000 shares when doing analysis. This is about 1% of my portfolio. Thanks for your contribution. I agree that the options grants are problematic. Like you, I think the positives outweigh the negatives and shares are attractive. I posted after market close, so I can’t take the credit. The increase is more likely related to JLMC’s annual report published the day before. My question relates to the “pre-paid advertising costs.” How is it worthless, if the ad hasn’t run? If you shut down the company, you are entitled to receiving (a majority) of the pre-paid ad costs from the ad agency/network, right? Still trying to wrap my head around this, but so far so good. You’re probably right in thinking that in the event of a liquidation, the company could probably salvage some of the costs of its pre-paid advertising. The reason I excluded the amount from my calculation is the “squishiness” of that asset. How knows how much value JLM could retrieve, or how long it would take? When computing liquidation values, highly uncertain assets deserve very large discounts. Great find and nice post! 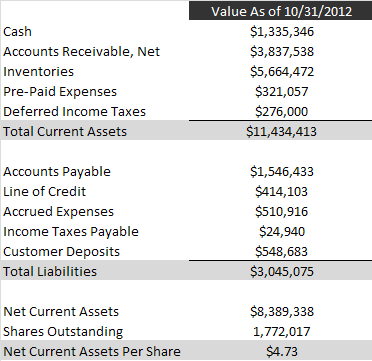 (btw, and this is surely a failing on my part, where do you find the financial statements for 2009 and 2008? I couldn’t find them either on their site nor on otcmarkets). – and wasteful SG&A (corporate entertainment, vanity projects, etc. ); in FY12 it was almost $10m on net sales of $27m. With the limited disclosure it’s really difficult to assess this against other comparable businesses. Coach ($5bn+ business), e.g., makes a much higher gross margin (>70%) but ends up with “just” 32 cents in operating profit on every $ in sales. So they spend about 38 cents per $ of sales on SG&A, which is roughly the same as JLM (even though the latter obviously doesn’t have anywhere near the type of economies of scale). So maybe it’s not fair to assume the expenditure is wasteful. The problem lies perhaps more in the gross margin; 40% is ok but needs to be better for a business of this type, especially for them to move away from the thin line between profitability and losses that they’ve been skirting for the last couple of years. Maybe a mixture of better production efficiency, some price increases and stronger bargaining power with suppliers over time can do that. Though this is just speculation. – future value-destructive allocation of capital (M&A etc. ); given the lack of disclosure on the board and ownership structure, it is difficult to judge whether there is a sufficient counter-balance to any such decision by the CEO/management. Below is the last ownership info I could find (2004 proxy statement – does anyone know where to find a more recent breakdown). It shows officers and directors with less than 50%. I wonder who now owns the remainder. Is it a real float? As for the question as to why the company went dark, I couldn’t find any useful discussion in the proxies I looked at. I’m sure the listing costs were a major factor. It also seems that the company did not offer any liquidity event or some such to minorities at the time. Lastly, has as anyone tried to contact management? Hi Eddy, you can find the 2009 and 2008 figures in the annual report filed January 20, 2011 on otcmarkets.com. I am in complete agreement with the concerns you’ve expressed above. Mr. Murphy doesn’t seem overly concerned with any shareholder besides himself and there’s no indication that will change in the future. From what I’ve learned, shareholders had to put the screws to him just to get him to hold an annual meeting and release financial statements. Interesting that Fidelity owned 10% back in 2004. I can’t imagine they still do. As always with these NCAV/net-net ideas, I think the basket approach is the way to go. This style of investing is not my sweet spot (though the historical returns are impressive) but I’d always recommend investing in at least 10. If over 3 years you get 4 triples, 4 break-evens and 2 complete washouts, that’s a decent return. Even better if you can avoid the washouts through some quantitative elimination like Piotroski or another method.